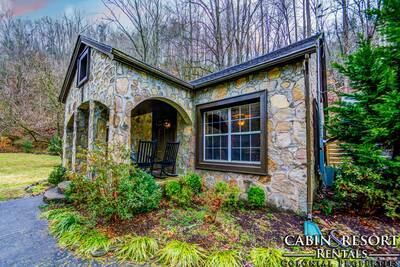 Welcome to Home Sweet Home in the Smoky Mountains! 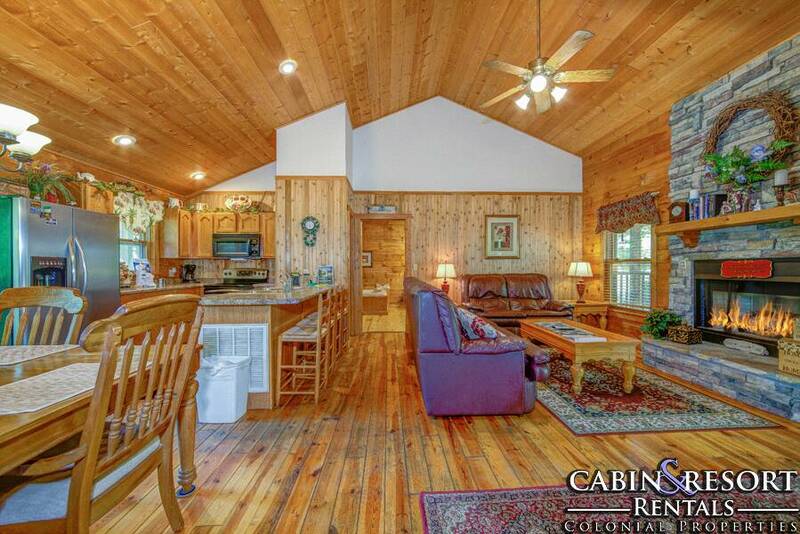 This stunning 2 bedroom, 2 bath cabin rental is a truly wonderful place to spend your next vacation getaway. Conveniently located with no steep mountains to climb or traverse, you and your guests will have easy access to shopping, dining, attractions and entertainment options. 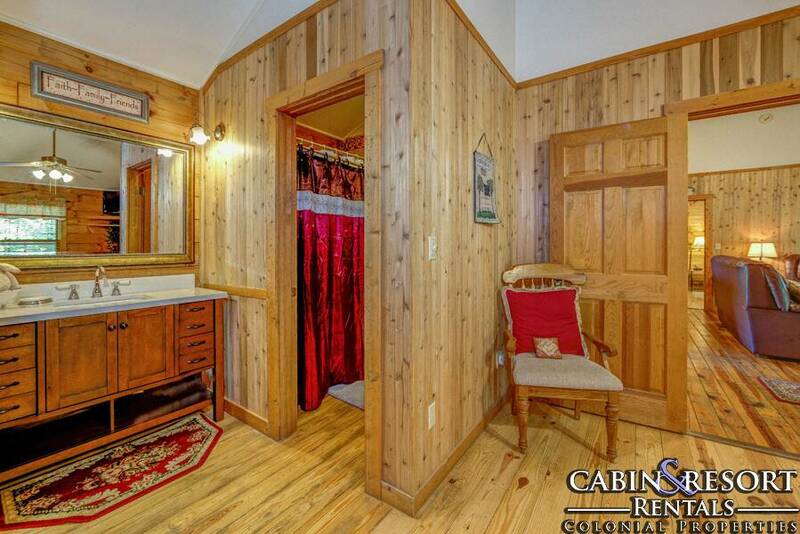 With no steps into the entry of Home Sweet Home, you can easily pull up next to the walkway and step right into this beautiful cabin. Once you walk inside, you are immediately greeted by the soothing natural wood tones that surround you. The incredible living room features plush leather furnishings, a cozy and warm stone accented fireplace, a wonderful cathedral ceiling overhead and a 50” flat screen TV for your viewing pleasure. 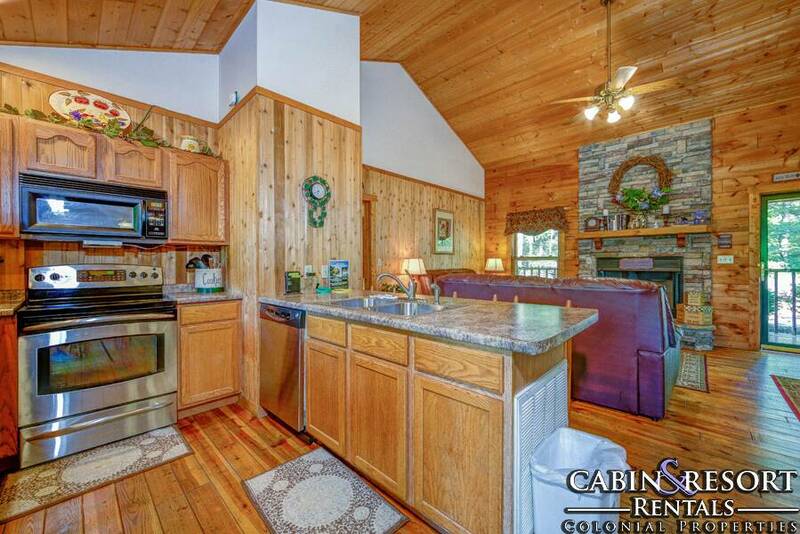 Adjoining the living area is the open and inviting fully equipped kitchen. 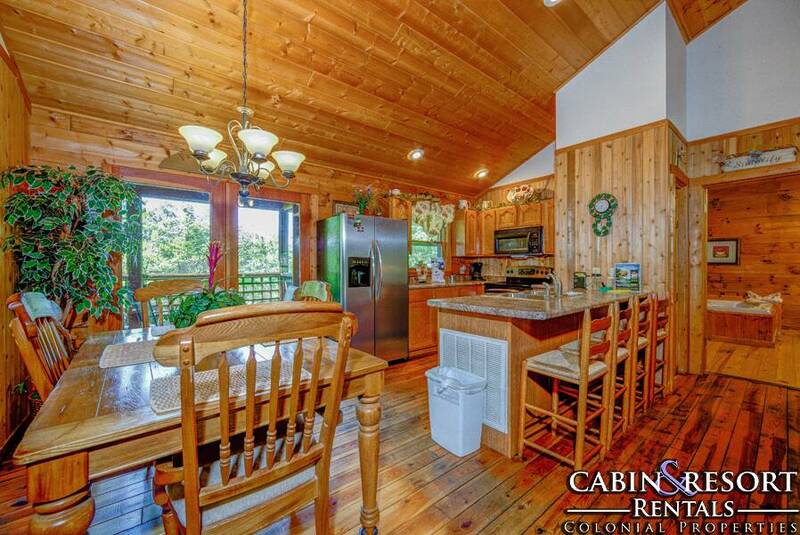 With modern appliances and all of the necessary utensils to prepare, cook and serve everyone their favorite meals while on vacation in the Smokies. There’s also a nearby dining table that comfortably seats up to four people. Home Sweet Home features two luxurious master suites – both separated by the living area. Each bedroom features a 32” flat screen TV, super comfy king beds, in-suite full baths, cathedral ceilings and romantic two person bedside jetted tubs. 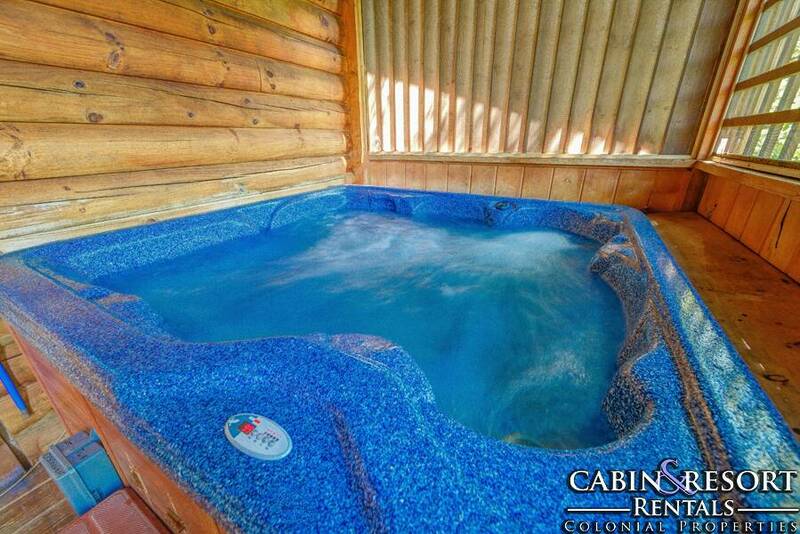 Enjoy a relaxing evening in the Smoky Mountains sitting on the screened porch or by taking a dip in the bubbling outdoor hot tub. There’s also a wonderful covered porch with BBQ grill and a picnic table that’s a perfect spot to enjoy a delicious meal outside while overlooking the forest. Don’t forget to bring along your laptop, tablet or smart device to take advantage of the complimentary high speed internet access while staying here. 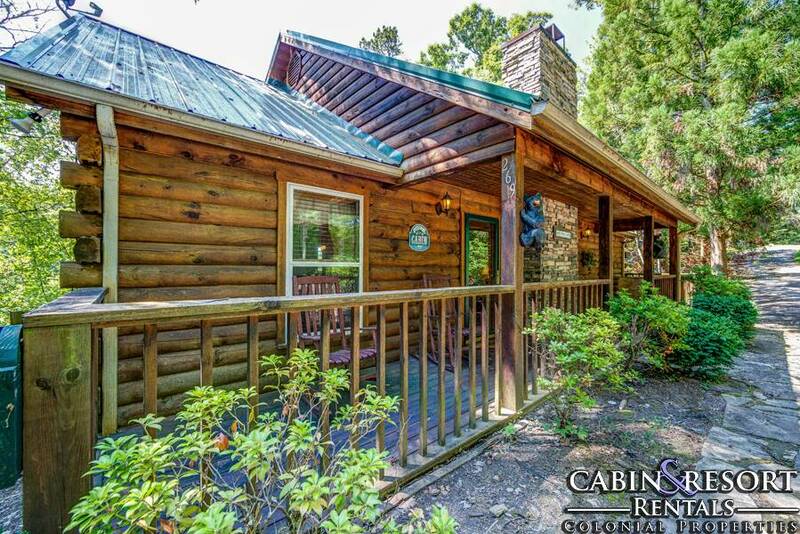 With its beautiful log and mountain stone exterior, convenient location and fabulous amenities, your stay at Home Sweet Home is sure to be an unforgettable vacation experience. 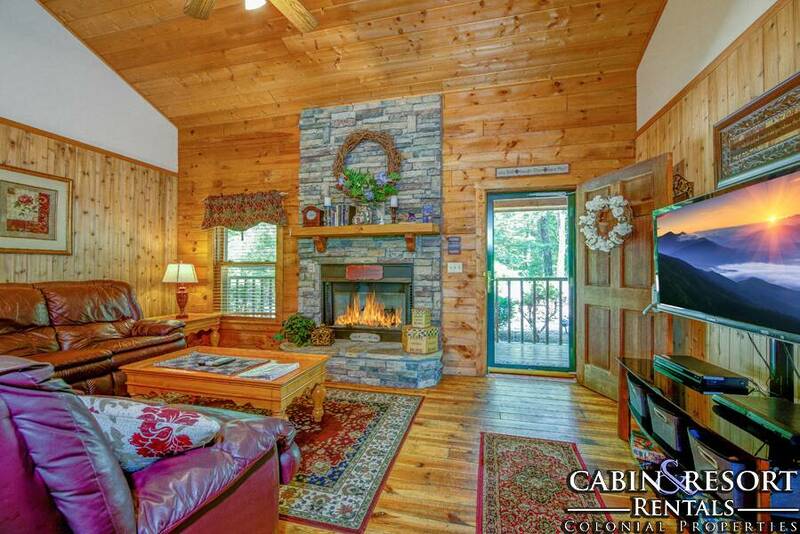 You’ll love the breathtaking double master suites, hot tub, screened porch and peaceful atmosphere. 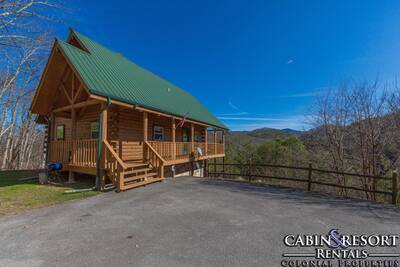 If you’re looking for a Smoky Mountain cabin rental to enjoy your next getaway, then reserve your stay at Home Sweet Home today! A: Hi Yasmin! Yes, Home Sweet Home offers complimentary WiFi. A: Hi Stephanie! Home Sweet Home has 2 King Beds and 1 Sleeper Sofa. A: Hi Lisa! It's right in the front. A: Hi Candice! Pigeon Forge is about 10 - 15 minutes away. A: Hi Megan! Less than 5 minutes. “ We thoroughly enjoyed our stay in Home Sweet Home. It is a very lovely cottage. It worked great for us, with 2 master suites. We loved the porch area with the hot tub. Plenty of room and was furnished very comfortably. I would definitely ask for this one again if we were able to make another trip to Tennessee. “ This was a family vacation (all adults). The colors of the mountains were wonderful. We brought home some great pictures. Everyone was friendly everywhere we went. We would like to return for another visit sometime in the future. 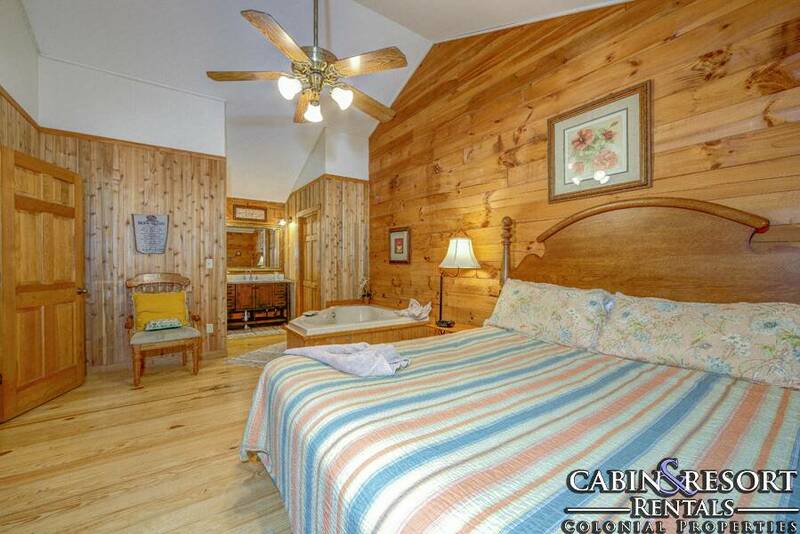 “ The cabin was clean and beautifully furnished with very neat decorations. 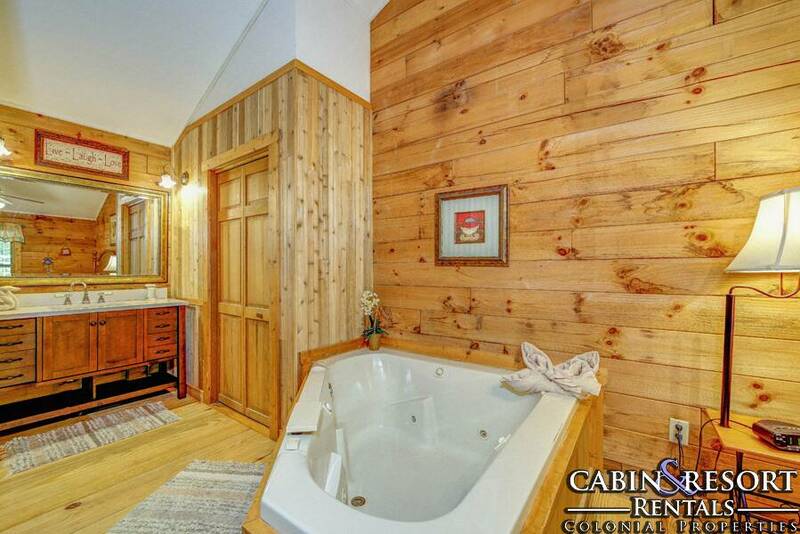 The jetted tubs in each bedroom and the gas grill was a plus. It was very quiet and peaceful. We enjoyed our stay and hope to return next year. “ Very sweet and very clean enjoyed everything. Thanks we will see you’ll again!!!! 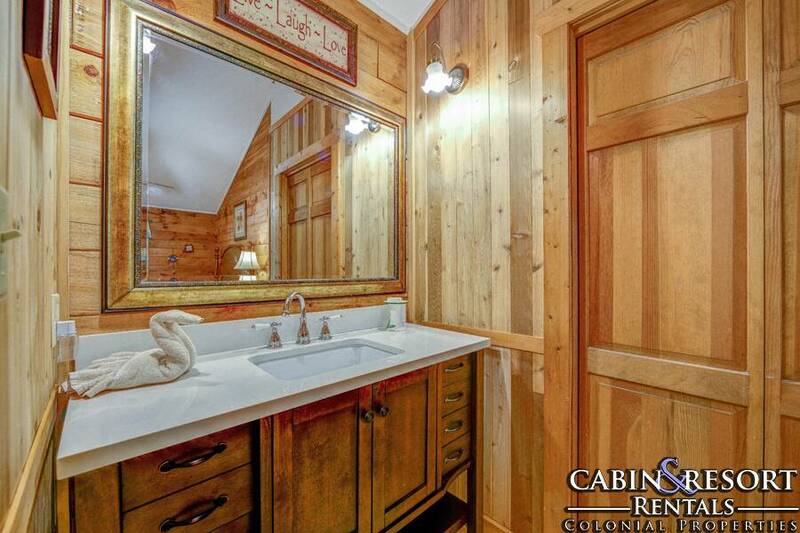 “ Have stayed in this cabin a couple of times. Fairly close to main highway, but far enough away to isolate any noise. 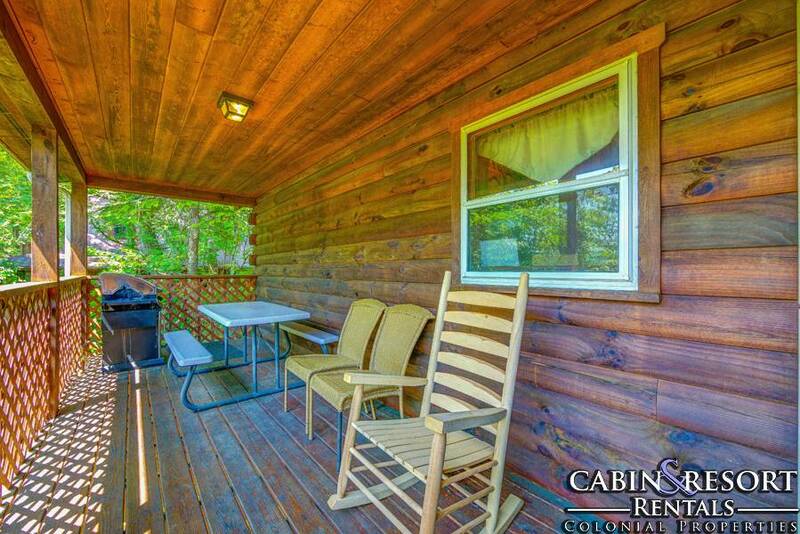 Cabin is comfortable with nice deck to enjoy beautiful view. “ Had a lovely, relaxing time! “ Great Experience!!!!! We loved the cabin and the customer service was outstanding!!!!! “ This was the absolute BEST most relaxing vacation we have ever taken. 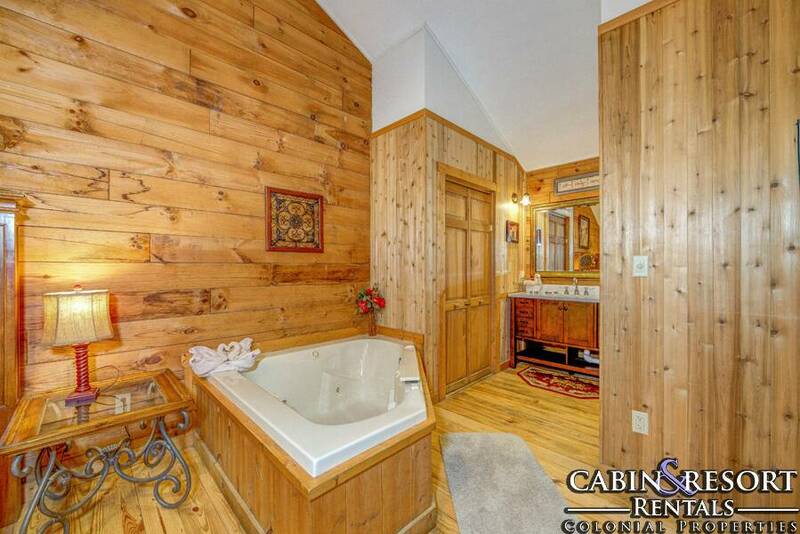 We enjoyed having the jacuzzis and hot tub available. The beds were the most comfortable of anywhere we've ever stayed. The place was immaculate in cleanliness. It was truly a home away from home. We did visit area attractions, but not at a rush rush pace as in our yearly Florida beach vacation. 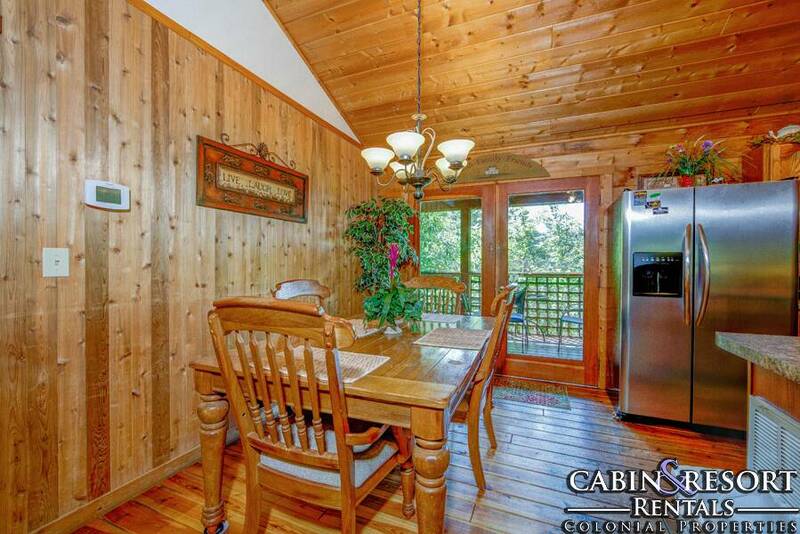 We will definately be staying in this cabin again soon. We loved it. Thanks for everything!! “ This was a wonderful time to share with my daughter and granddaughter. Having the 2 master suites in the Home Sweet Home cabin gave each of us our own space during our quiet time and the very nice great room and kitchen could not have been more enjoyable!! 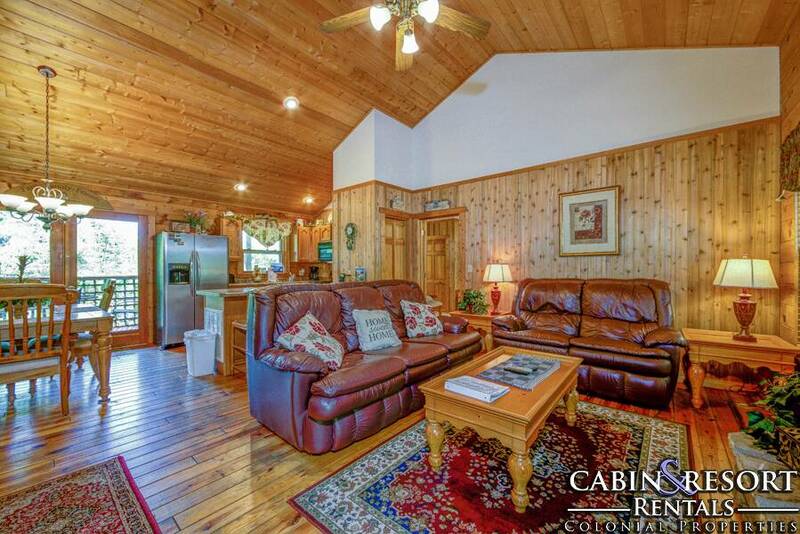 The interior layout of this cabin fit our needs perfectly. “ Wonderful, great get away.... would definitely book again! 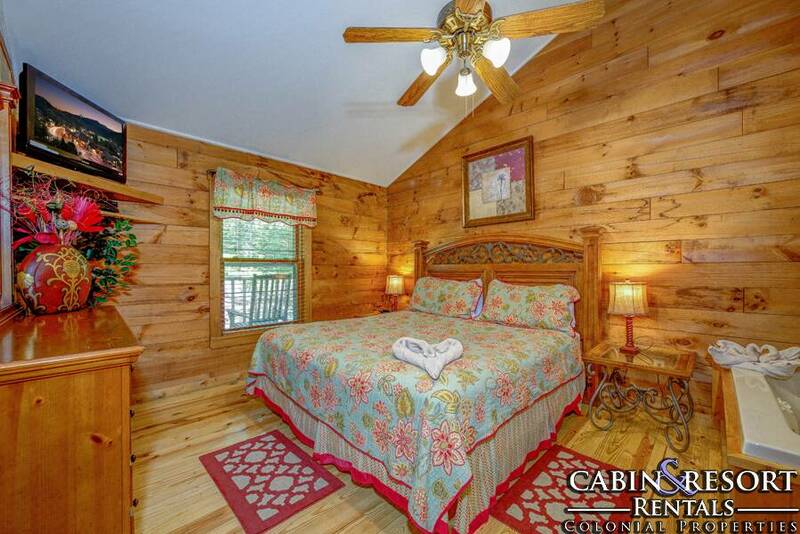 “ My family really enjoyed our stay at the Colonial properties cabin ! We did not want to leave once it was time to go! We will definitely be back! Thank you so much for taking care of us !! ?? “ We spent two nights at Home Sweet Home. It was clean and the location was great. My husband played golf and I shopped. We had a great time! “ Colonial Properties made arrival and departure smooth,providing information exactly when promised! Home Sweet Home was found to be clean, furnished nicely! “ We really enjoyed the visit to the Smoky Mountains. Our stay in the cabins was great. We weren't sure that they would be as nice as the pictures but they were. We enjoyed the nice view, hot tub and clean cabin. There is lots to do in the area and you couldn't do it all unless you had more than a week. We would recommend Colonial Properties for a nice place to stay in the area. “ It was great. Love to stay at this cabin. Don't have to climb stairs. Very clean. “ Enjoyed our stay at cabin. Had trouble with are air the first day of arriving. Called them at the office they were there with the hour and got it fixed. Was very satisfied with our cabin..Loved it . Would stay here again. “ Our stay was very relaxing. Our kids loved the hot tub and jacuzzi. It felt like home. We would definitely come back and recommend someone else to stay! 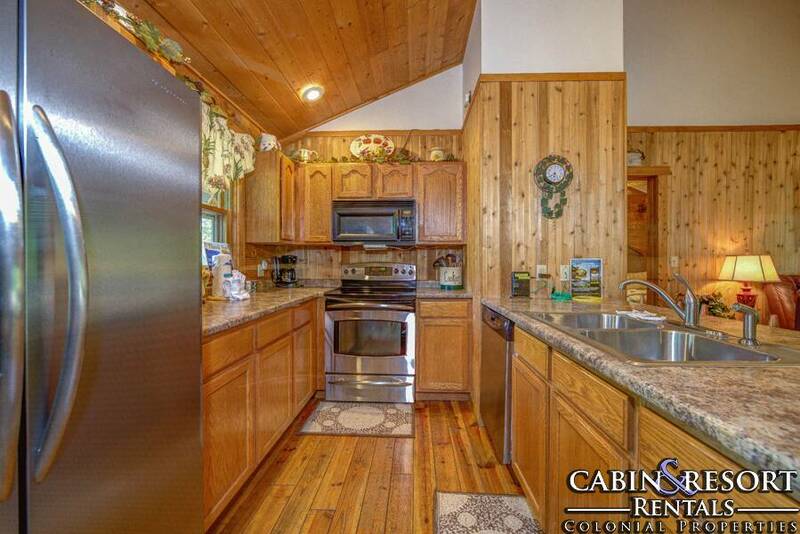 “ Our family had a wonderful time staying at the cabin. Everything was clean & everything was better in person then the pictures online! Awesome prices & very friendly employees! “ "Home Sweet Home" was everything we wanted in a cabin, we thoroughly enjoyed our stay, it was the perfect family getaway. “ We love Colonial Properties. They are always ready to help and are always giving service with a smile. As far as I'm concerned we will always use Colonial Properties because we always get what we are paying for. Thank you very much! 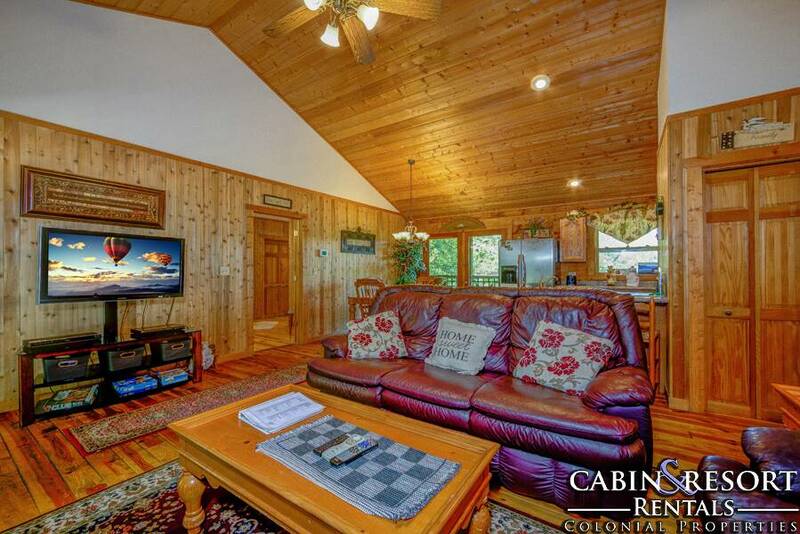 “ This was the best experience my family has ever had in the Smokies. We loved the cabin and the location was perfect. 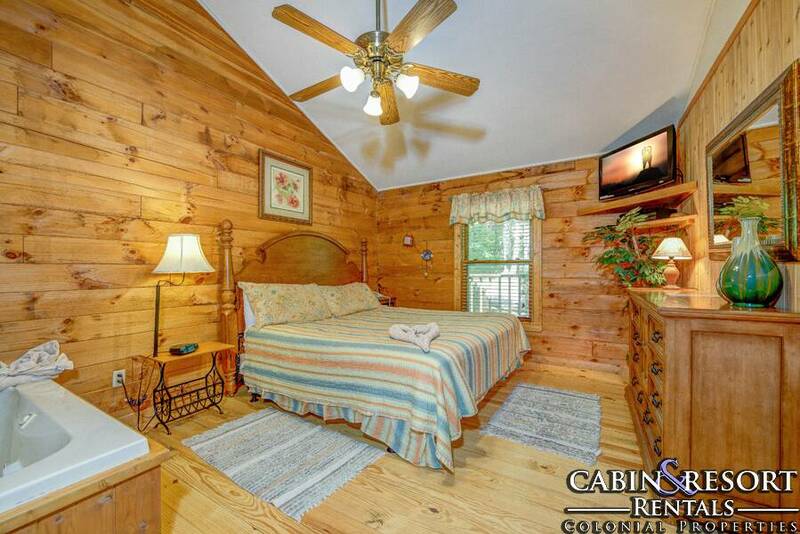 I cant say enough about Colonial Cabin Rentals, they were top notch in every way. We look forward to staying again. 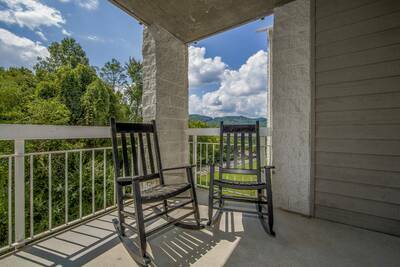 “ We had a great time at our vacation rental. The photos and descriptions were very accurate so there were no surprises upon arrival. While the location was not as secluded as we would have liked it was very quiet and serene. For two couples this was a great house and a great value. We'll definitely check back on our next trip to East Tennessee. “ We loved our stay at Home Sweet Home. “ Home Sweet Home is a wonderful place to stay. The pictures online are beautiful but to see in person takes your breath away!! The accommodations truly spoil you. I loved the 2 large master bedroom suites. 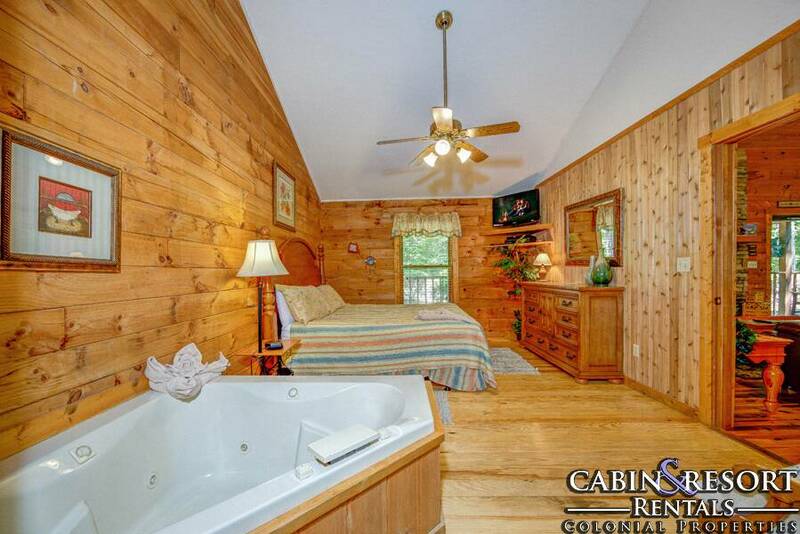 They were located at opposite ends of the cabin which gave you added privacy from anyone vacationing with you. All areas were very spacious and I never felt cramped. 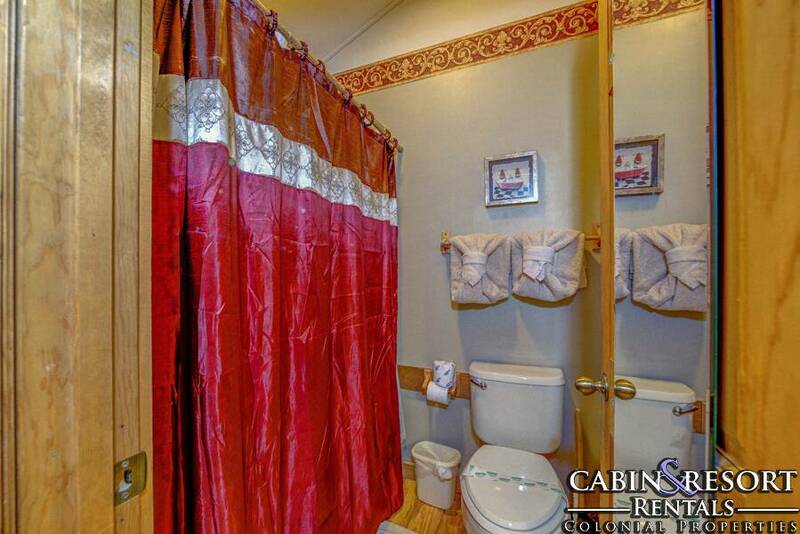 The cabin is located very close to many shops, restaurants, gas stations, etc. You are minutes away from many "hot spots" which is nice. Convenience was important to me and I was pleased with the area we stayed. I would DEFINITELY stay here again & DEFINITELY book through Colonial Properties. Wonderful People!!! “ I loved staying at this vacation rental. It was just what I was looking for!! I had the best time, I didn't want to leave. But you always have to go home so the next time it will be just as exciting!! 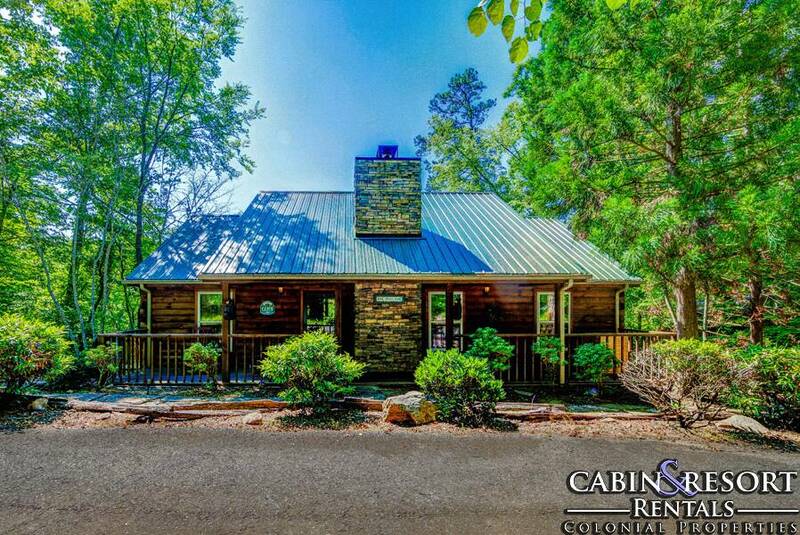 “ The cabin was great get away for the weekend! Me and my girlfriend loved it. Nice and cozy, felt like home! 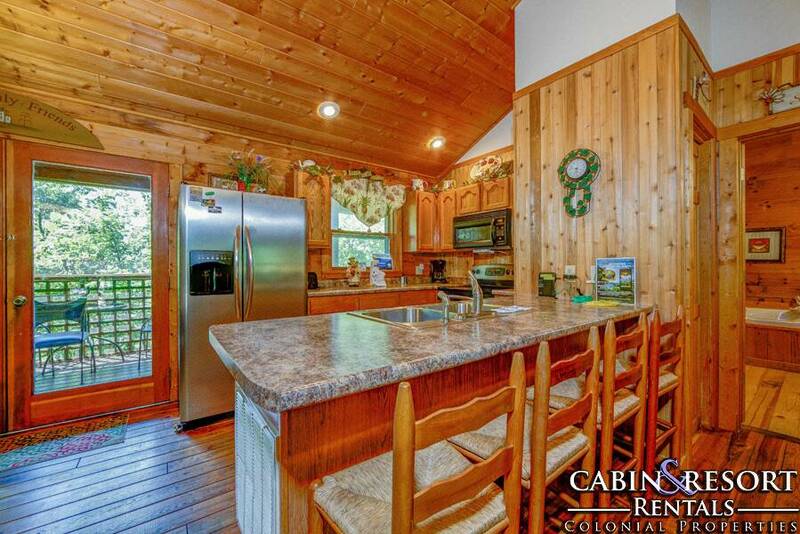 “ Home Sweet Home is a beautiful cabin in a great location. My family and I hope to come back here on every visit to Pigeon Forge from now on. 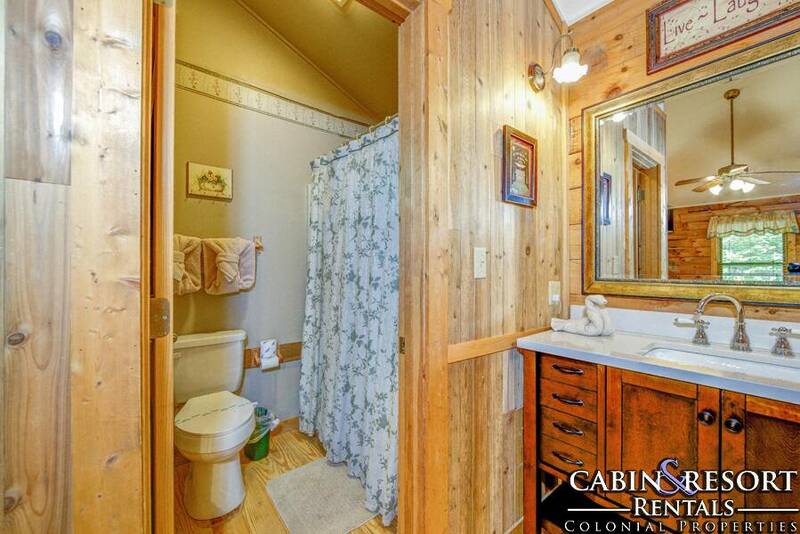 “ The cabin is in a perfect location. It is far enough from all the businesses but close enough so you don't have to travel too far to the mall, etc. “ Beautiful cabin. We enjoyed our stay there. There were a few minor problems. The jacuzzi would not turn on in one of the rooms, and very small Internet and satellite issues but they came back on very quickly. There were 3 flat screen tvs and DVD players which was great. We also grilled out and found the kitchen to be well stocked. The cabin had a nice cozy feel and I liked how the bedrooms were on separate ends of the cabin which allowed for more privacy. 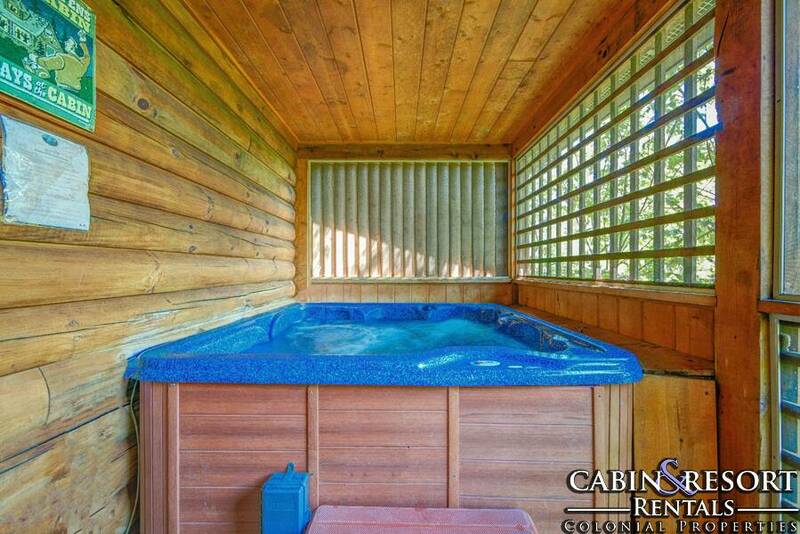 There is a screened in porch and the hot tub was on it. 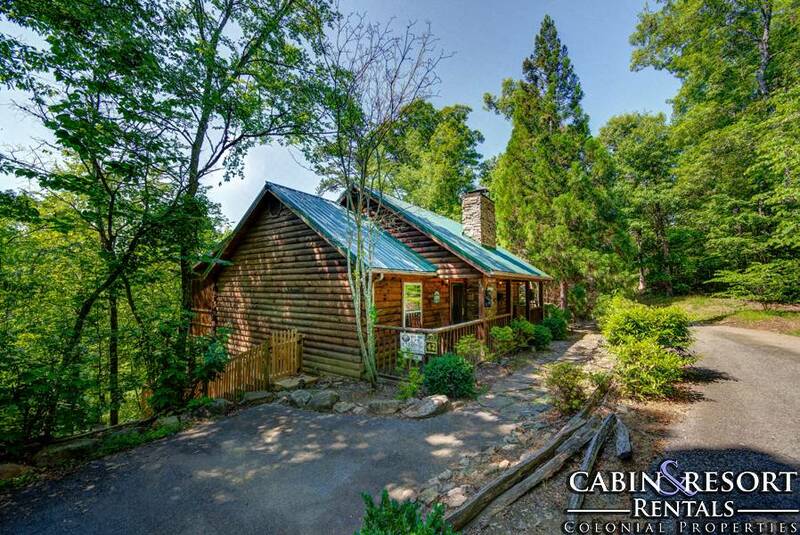 There was not a view but the cabin sits at the top of the mountain nestled in the woods. 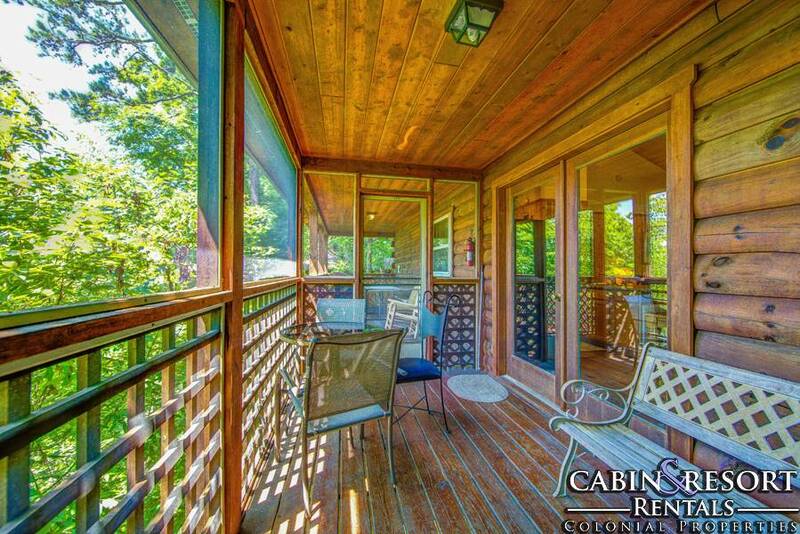 When you are on the back screened in porch you look out over tree tops and can see the cabins below. I would definitely go back and would highly recommend staying there. 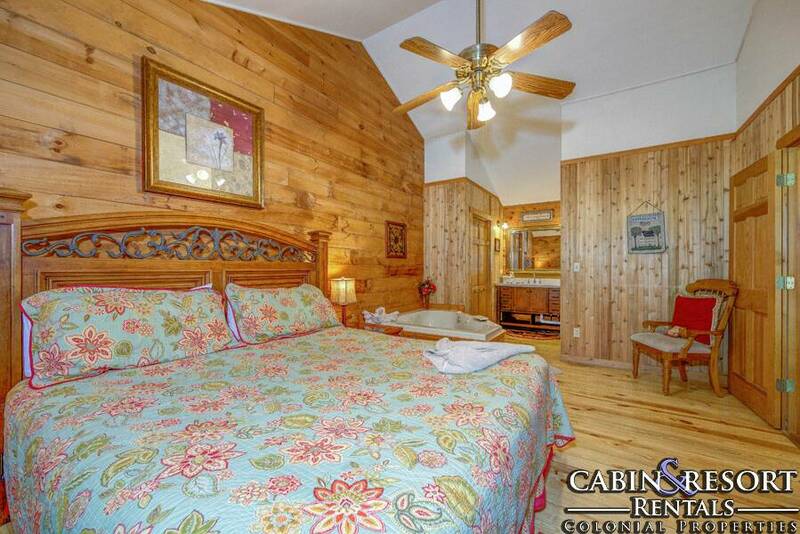 “ The cabin was wonderful and peaceful.It was clean and the location was very good.I will be staying there again.